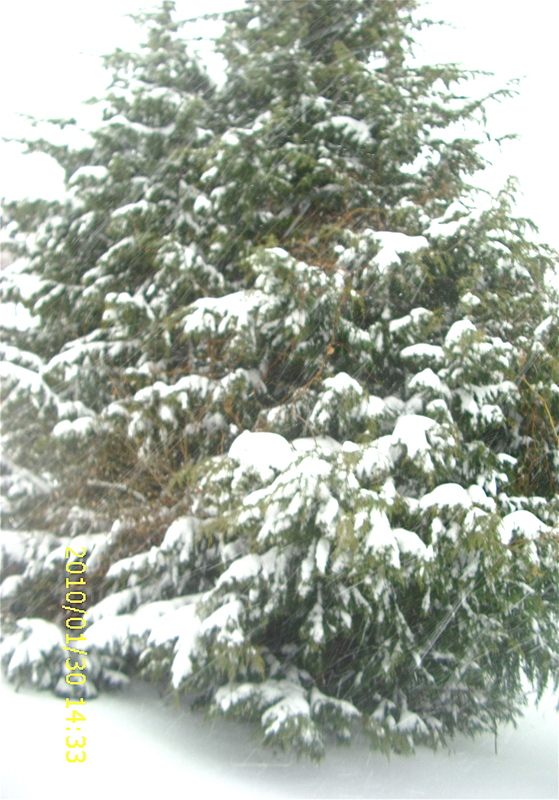 A TALL, SNOW-COVERED, OUTDOOR CHRISTMAS TREE IS THE RIGHT SOLUTION WHEN YOU LIVE IN A SMALL, INDOOR APARTMENT. I’m making some progress on downsizing and simplifying my lifestyle. Two years ago, I moved from a large apartment in a pricey suburban neighborhood to a small apartment in a rural/seasonal resort area three hours from the cities. 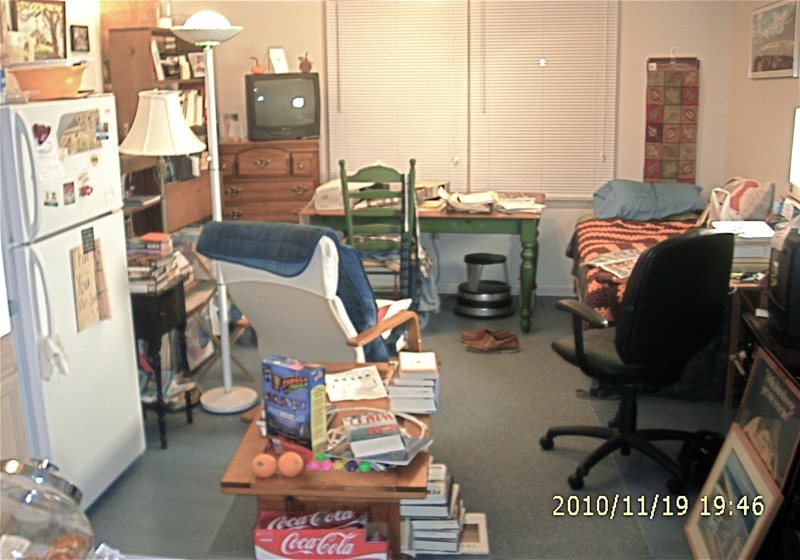 I gave away a lot of stuff, and moved what was left helter-skelter into a one-room apartment. It has two windows in front and a door and screened porch in back. Cross-ventilation! Rent is reasonable and includes all utilities. Priceless amenities are a quiet street that ends at the marsh; a parking space; a small fenced yard, with nothing but woods beyond; cable TV and high-speed internet service. 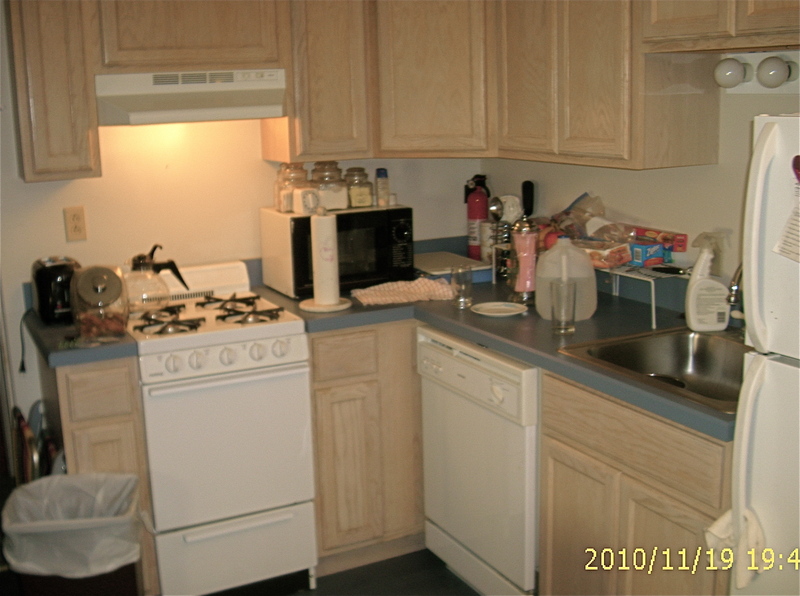 A COMPLETE GALLEY KITCHEN. EVEN A FIRE EXTINGUISHER, IN CASE I TRY TO COOK. My neighborhood is an enclave of quiet affluence. Within sight, across the water, is a resort that can be rowdy in summer and a ghost town in winter. I might be the poorest church mouse on the block, but not the only one living on a tight budget. A few of the houses are little more than old beach cottages, but most are medium-size, modern homes with that suburban look. Some of the more spacious houses have million-dollar waterfront views. Within a short walk are two grand, waterfront homes that must be worth . . . I can’t even guess. One of them is a modern mansion. 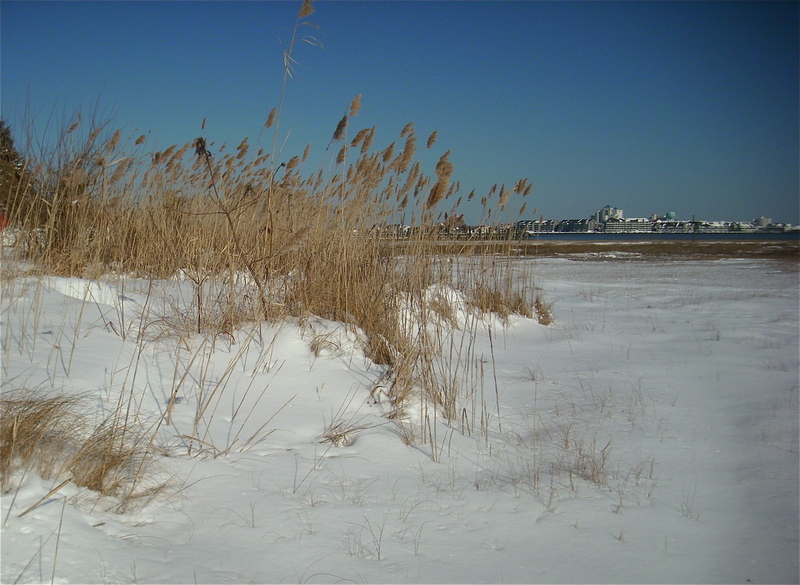 THE MARSH IN WINTER. VISIBLE BY WALKING DOWN THE STREET. NATURAL BEAUTY AND PUBLIC SPACES ARE IMPORTANT AND USUALLY FREE. But I digress. This post is not about living large in a mansion. Anyone could do that. And it’s not about living large in your car or a tent, which would be more of a challenge than I’m up to. We’re talking about a modest and attainable goal of living large in a small apartment. (If your apartment has a separate living room and bedroom, with a walk-in closet . . . well, that doesn’t qualify as small). If It’s Big Enough For A Cat . . . SAFE AT HOME. LOLA IS PERFECTLY CONTENT IN A SMALL APARTMENT. My challenges with living large in a one-room apartment are the same ones I would have in a big house. 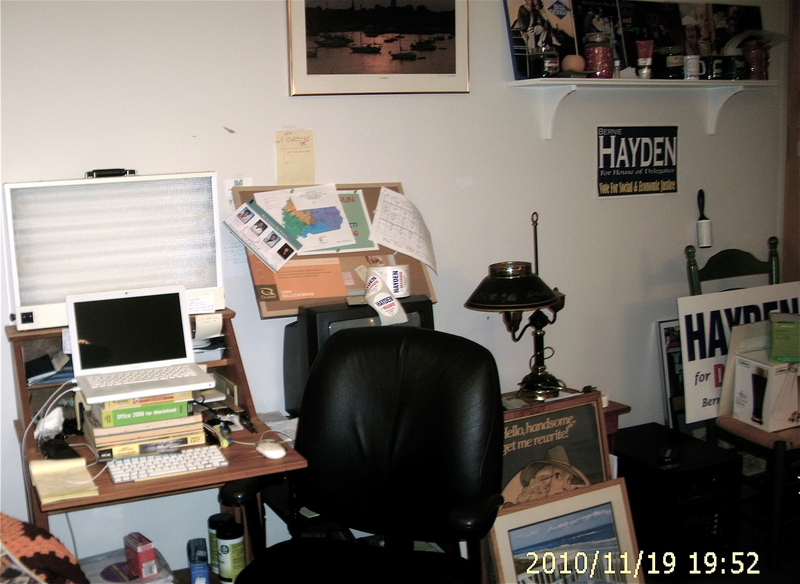 Fundamentally, I have no “nesting instinct.” Plus, I’m disorganized. The only kind of order that comes naturally to me is “Robert’s Rules of Order.” For everyday life, the nesting instinct is more useful than Robert’s Rules. Pay the rent on time. Otherwise, you will be living in your car. I’ve got to get organized, and it can’t be forever put off until tomorrow. Two years is long enough. You can break the small-furniture rule once. I still have the same medium-sized dining room table as when I lived in more spacious apartments. The table is clunky and dominates my one-room apartment. But it’s an all-purpose table. It serves as dining room table, kitchen table, and desk. I need a certain amount of surface area to be organized, whether the task is paying the bills or making soup. Experiment. Find a way to make the furniture fit. I’m on the third rearrangement of my furniture. After two years, you get tired of playing “furniture checkers.” Furniture checkers is a game in which you have to move one chair and jump over at least one other “thing” in order to get to your goal. There must be a way to arrange this furniture efficiently! I will have to find it by trial and error, since I have no interior design skills. HOME OFFICE OF THE ConsterNation BLOGGING EMPIRE. SOMETIMES ALSO USED AS A POLITICAL CAMPAIGN HEADQUARTERS. I’ve saved the most important secret of living large for last. 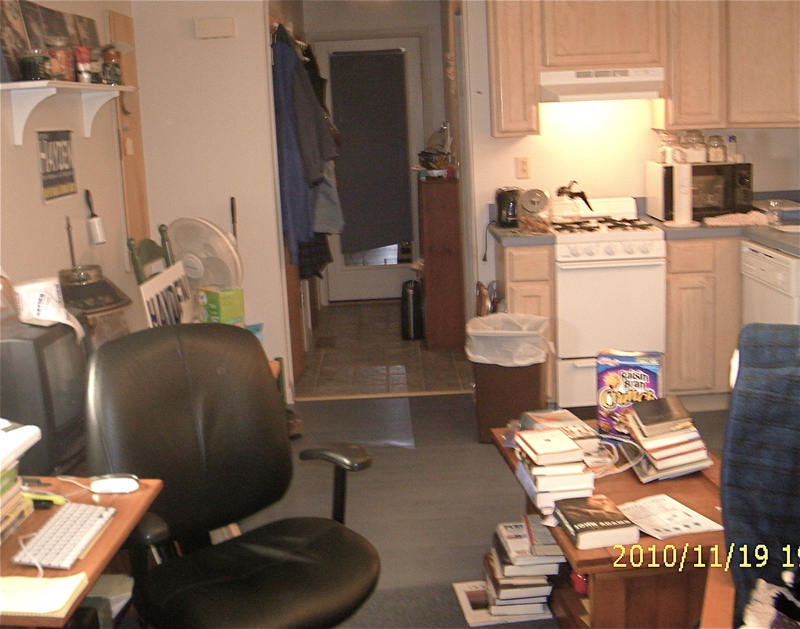 As you can plainly see from the photos, I need to reduce clutter. People sometimes criticize me for having too much “stuff.” I’ve gotten rid of enormous amounts of stuff, but I still have too much. Other people have their stuff all over the basement, the garage, the attic, the walk-in closet, the guest room. And that’s not all. Homeowners often rent a storage space for their extra stuff. Why don’t they simply give it away or sell it on eBay? Everything I own is inside my one-room apartment, or inside my car, which is parked in the driveway. And there’s a limit to how much clutter I can hide in the trunk of the car. To sum up, I need to get organized and reduce clutter. That’s not too much to ask. I call this challenge “My Apartment Project.” Two years is long enough to put it off. What you see here are the “before” pictures. Coming soon will be the “after” pictures. Wish me luck and stay tuned. If you have any helpful tips on one-room apartment living, they would be welcome under “comments” below. This entry was posted in Frugal living, Housing, SIMPLE LIVING and tagged Apartment, Clutter, Photos, Simplicity, Thrift by Editor (Retired). Bookmark the permalink. I wish I had a suggestion or two for you, but I’m nearly as bad when it comes to clutter and chaos…and disarray. Baskets and storage type racks are all I can come up with. A serious talk with your possessions, asking which ones want to be ‘liberated’? Actually, your view and the screened porch are quite envy-producing. If you need a couple of hours of help cleaning/making room for your stuff, I make $10.00 an hour. Send me an email, you know where I live-keep my stuff. Thank you, Cathy! I’ll keep your offer in mind. Do you think we’ll be having a white Christmas? Now you’ve done it – you posted it so you have to do it – organize the space! Floor to ceiling shelving on one wall, with storage baskets to help contain the stuff, is the current design trend. That’s all I got!! Not much help, but I want to see the finished product. I cannot let go of a book, but I have become fond of regular extrusions of everything else. There is a charming little book called “Clear Your Clutter With Feng Shui,” by Karen Kingston, which, Feng Shui aside, contains a useful chapter on triaging your crap. She offers an insightful algorithm for determining why you have decided to hang onto something and whether your reason holds water. The whole Feng Shui thing can sound rather airy-fairy but as I work with it, it seems to be a useful system of codifying the way that people react to the arrangement of spaces. I used to cling to stuff much more, until my late and ex-husband’s pathological hoarding made me frantic. When you find one of your cupboards stuffed with objects including an entire laundry basket’s worth of gloves in all sizes and conditions, you not only learn to love those trucks that pick up the trash and carry away bags of donated clothing, you attack your own retained possessions with reformist zeal. 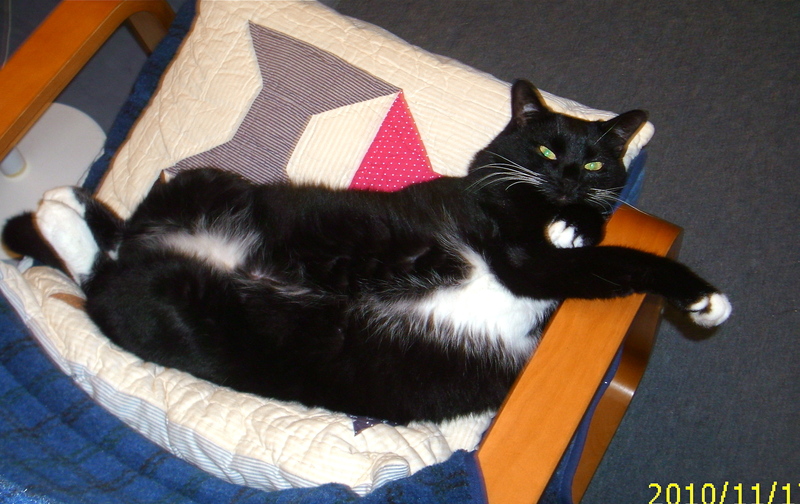 Lola is adorable and reminds me of my tuxedo cat Patricia Twinkle, a pixie who could leap tall dressers in a single bound. Your little home sounds wonderful and I absolutely love that tree! Living small isn’t as bad as most people would imagine. One of my favorite places I’ve ever lived was in a little village of, “rondettes,” built on the side of a mountain overlooking the city. I had two rooms and both together were probably not as large as your place. My large dog learned to walk backwards. The rondettes lined the sides of that mountain. Mine was split into a duplex and was the shape of a pie –I had the half on the dark side. I loved everything about my little half of a pie. I still have a round stool on wheels someone gave me while living there. It was originally purchased as a gift for a mechanic, but his daughter who gave it to me said he, or at least a part of him, was too big for it. Some things you just can’t downsize. The rondette lifestyle sounds good to me. I recently heard an interview on NPR about the 12 x 12 foot cabin off the grid lifestyle. I’ve got to look up that book and write a post about it. That will make a nice post. I knew people in the mountains who lived “off the grid” and they loved it. Thanks so much Penney, for the reblog.